Click here for profiles of Notable Women Hockey Players over the past eighty years. 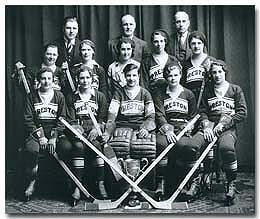 1890s Women's hockey gains popularity in universities, principally at the University of Toronto and Queen's University in Kingston, Ontario. 1920s Bobbie Rosenfeld and Myrtle Cook, former track stars and hockey players in their own rights, become Canada's first women sports reporters, specializing in hockey during the winter. 1930s The Preston Rivulettes rule the ice lanes (see Hilda Ranscombe). Click here for an interview with Ruth (Dargel) Collins of the Preston Rivulettes. 1940s The war halts any development of the women's game, which doesn't revive until the early 1970s. 1956 Abby Hoffman challenged hockey's gender barrier by playing in a boys league under the guise of being male. 1970s Shirley Cameron becomes hockey's first star of the modern era. 1987 The first ever Women's World Championship takes place in Toronto. However, it is not recognized as an official tournament by the IIHF. 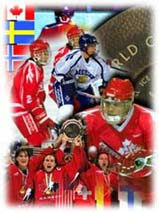 1990 The first official and IIHF-sanctioned Women's World Championship is held in Ottawa. 1998 Women's hockey becomes a full medal sport at the Olympic Winter Games for the first time. 1999 The women's division at the World Championships expands to two pools, A and B. 2005 USA ends Canada's streak of eight straight (nine unofficial) world titles in a shoot-out. 2006 Sweden becomes the first non-North American team to earn silver at the Winter Olympic Games beating United States in the semi-finals. 2010 Canada wins its third straight Olympic gold medal, defeating the rival Americans in a hard-fought 2-0 final. Cammi Granato and Angela James are first women selected for induction into the Hockey Hall of Fame. 2013 Geraldine Heaney becomes the third woman Inducted into the Hockey Hall of Fame. 2014 Canada wins its fourth straight Olympic gold medal, scoring the tying goal with seconds left in regulation, forcing overtime in an epic championship contest against the United States. 2015 Angela Ruggiero becomes the fourth woman Inducted into the Hockey Hall of Fame. 2017 Danielle Goyette becomes the fifth woman Inducted into the Hockey Hall of Fame. 2018 For the first time in Women's Olympic Hockey history, the gold medal-winner is determined by shootout. Jocelyne Lamoureux scores the winner for the USA as they defeat their rivals from Canada. "Name the most significant moment in women's hockey?" * This tournament was not officially sanctioned by the International Ice Hockey Federation. The World Championship did not take place in 1998/2002/2006/2010/2014/2018 (Winter Olympic Games) and 2003 (Sars-related cancellation). For more hockey lists, check out our Records and Rankings section. Kelly Dyer, who earned two World Championship silver medals with Team USA, served as backup to NHL all-star goaltender Tom Barrasso during her high school playing career at Acton-Boxboro in Massachusetts.